I'm going to go out on a limb here. (I don't usually drop into rumors and speculation about future model announcements.) Nikon is going to show back up in the mirrorless camera realm, and very likely within the next two to three months. They really want to ship before the end of the year. But exactly what is it that they'll ship? Ah, the 64,000 yen question. As I've indicated elsewhere, Nikon has pretty much prototyped everything, from new CX (Nikon 1) options to entirely new DX to FX mirrorless cameras, both with and without the F-mount. Here's my current bet: we'll first see a DX mirrorless option from Nikon targeting about the low DSLR point in performance/function (though it is likely to be more EOS M5 priced). 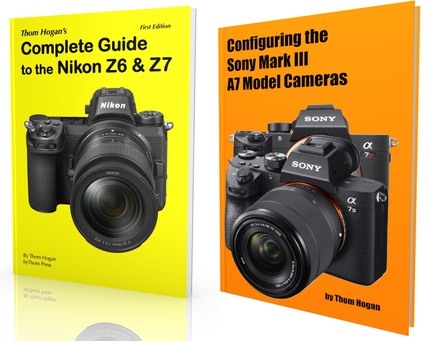 While I know a lot of you have been clamoring for Nikon to compete with the Sony A7/A9 series using a full frame entry, I don't believe that will be Nikon's first move out of the gate, and for the same reasons that Canon didn't make that move first. The risk of being perceived as coming out with something too little, too late is higher in full frame than with crop sensor. Moreover, Nikon's weakness is in the under US$1000 mark right now, and that needs fixing. Thus, my additional bet is that full frame from Canikon in mirrorless happens around Photokina 2018 time (fall). The D5, D500, D850 introductions have nicely solidified Nikon's performance camera base in DSLRs. Nikon doesn't want to be sending mixed signals, just as Canon didn't want to send mixed signals with the initial EOS M models. DSLRs for performance aren't dead, but certainly mirrorless for convenience/travel cameras is very alive. Nikon is also averse to self-cannibalization. Thus, Nikon isn't going to undercut the D5, D500, D850, D7500 just after having produced them. On top of that, Nikon's lineup weakness today is all below the D500 (or perhaps below the D7500, it's difficult to judge on the early D7500 numbers). Nikon has proven that with a bit of sales promotion they can move plenty of D500, D750, and D810 bodies, plus the D850 is an announcement hit and should be tough to find in stock between now and the end of the year. Where Nikon is weak is between the Coolpix P900 and the D7500, exactly where a crop sensor mirrorless system would live. The critical thing for Nikon is messaging right now. The Nikon 1 message being sent is that it is dead. Samuel Beckett would probably be writing a play called Waiting for V4 at this point ("Nothing to be done/I'm beginning to come round to that opinion."). There must be a clear statement as to what happens with Nikon 1. Better still, fix Nikon 1 and continue it as the small entry option in place of the DLs. But that requires feature, compatibility, ergonomics, price, and other adjustments. There must be a clear statement as to where any new system fits in the full Nikon product line. Hint: it currently would go Coolpix->(CX)->new mirrorless->pro DX->pro FX, with each level gaining performance and ability, but all having the same base ergonomics and feature set, and recognizably Nikon. There must be a full and useful initial lens set plus a lens road map at launch. Not the "some things behind glass" you did at the Nikon 1 launch. If you can't match or beat the EOS M, you're not ready to launch. Don't panic, and don't forget to carry a microfiber cloth.